Update: I just realized that this whole thing is a satirical joke. (Thanks to "Crispy" below for enlightening me.) Bachmann never actually said any of this. But I'm leaving the post up because I'm not sure which is funnier: Craig's faux interview, or the fact that I fell for it. "My hero!" -- Michele Bachmann. Make of her selection what you will. I'm sure she's just kidding around. This is, after all, the snooty-snarky Vanity Fair. (Disclosure: I vote democrat.) (Since I'm a Vanity Fair reader, you probably already knew that.) (Just don't hate me for being simultaneously smart and vapid. It's harder to pull off than it looks.) Nevertheless, if she gets elected, just to be on the safe side, we should probably keep all sharp objects out of the Oval Office! Don't worry--she won't be elected. Still, it make me very afraid that people like her think they can be elected. Really, isn't the funniest part that it was so damn plausible? Wait, maybe that's more sad than funny. American politics are scary. LOL! I think that makes it even funnier! 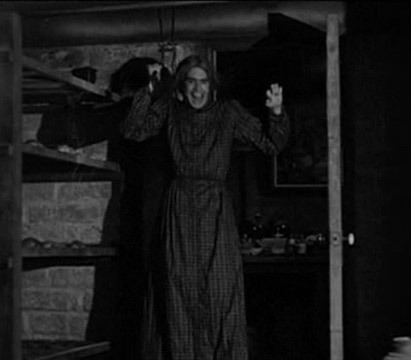 I think you may be missing the real reason why Norman Bates may be Bachmann's hero, the "Dressing for Success" angle. Since the only way she will ever be nominated is if she visits her fellow candidates in the shower,suitable dressed, her admiration for Bates' wardrobe (admittedly satirical) has something to do as much with the accessories, not to put too fine a point on it, as with the dress. The nomination after all, is a process of elimination. On a related note, I notice that Mitt Romney is now touting Herman Cain as his main alternative. From what I gather Cain promises to deliver your pizza hot,if you vote for him, while Romney promises to deliver your dog hot, well OK his dog, hot, if he is elected. If that's your idea of a hot dog. I find Hoover's promise of a chicken in every pot more appetizing, and if someone would promise pot in every chicken, I definitely would consider voting for them. Even a Republican. Hey, I voted for one of them, once. As for lapsing into being a vapid Democrat on an occasional basis, some of us make that the nearly entire focus of our blogs, with side excursions to creepy mansions at the top of the hill and musty fruit cellars, where mummified mothers, hit the Boone's farm, judging by the smiles on their face, as they sit in their rocking chairs. Any resemblance between that comment and any presidential candidate or candidates who are off their rockers (without the excuse of hitting the Boone's Farm in the fruit cellar),is strictly coincidental.